Disabilities are so vast, I am not able to deal with all of them. I have a spinal cord injury and am paralyzed so I will deal with my particular view of mobility needs. I would LOVE it if you want to add your own ideas that are unique to your disability in the comments. When I attended Roll On Capitol Hill in Washington D.C., one of the things we were working on was asking them not to do away with the funding for our specialized equipment. I asked one of my Congressman if he felt that all of the congressmen would be okay wearing size 8 shoes from Walmart. He assured me that would not work as they all wore different sizes. I told him that he made my point. We also are all different shapes and sizes and have different needs depending on our disabilities and a one-size-fits-all wheelchair will never work. He agreed. When you talk about the mobility needs of a person who is paralyzed, it is easy to say, “Duh…they need a wheelchair to get around!” True! But what kind? A manual chair? A power chair? A manual chair with a power assist? A standing chair? A 4×4 all-terrain outdoor chair to hit the yard, sand and nature trails? I would love to say YES to all of these!! But unless you are very rich, that won’t happen. Many times, your injury decides which chair you get. A high cervical injury will almost always use a power chair because of the lack of upper body movement. My injury is located at the C5-C7 level. If I was a complete injury, a manual chair would not even be possible. I have used a manual chair for 9 years and have had an older power assist for longer days and outdoor use. That power assist has not worked for over a year now and with some issues this past year that has caused a lot more pain, spasms and loss of strength in my already weaker upper body muscles, I am now using a power chair part of the time also. More versatile to travel around with others as you can throw them in any vehicle – even if you need help with the transfer into the car. Minimalist in design so easier to maneuver in tight spaces. Easier for others to help get you where you need to go in the presence of stairs, or no curb cuts. All pushing is on you. Will need help pushing on steep areas, over rough terrain, or when you are too tired. No assistance is needed as the powerful motors can take you where you need to go. Energy and upper body wear is maintained. The customized ones tilt, recline, elevate your legs and lift the seat height to eye level which allow much more access to things in your home. Long days/distances are not as fatiguing. They are very heavy and can only be transported in vehicles that have a lift or ramp to carry them. They have batteries that must remain charged so they take more maintenance. I have always used a manual chair which served me well for about 7 years. I have been fighting insurance for about 3 years to get a new manual wheelchair with a power assist added on to help me. A power assist is a power feature that is added to a manual chair. It has tried to bridge the gap by giving you all the pros of a manual and power chair without the cons. I just now finally got approved of all funding for my manual wheelchair (about $6,000) and the power assist ($5,000) and so now you know why I had to wait until insurance could pay! I could not afford that. I was also just given a power chair that is not a jazzy style chair. I have been given the jazzy styles before and while I am very thankful for them, they are not custom to my body and are not made for people with spinal cord injuries. They are made for those who can walk but need help with a long day. This power chair is a high end custom chair that fits me perfectly! It has many features and it has felt SO good for my body!! I do always have this fear that the batteries will die while I am out and I will be stranded! But so far, it has been fine! My opinion, is that everyone with a spinal cord injury should have BOTH a manual and a good fitting power chair. Having the freedom to go with friends in their vehicles, or to go to places that aren’t accessible, or to keep up the exercise that your upper arms need (if you have the strength to propel yourself) is why you need a custom, lightweight manual chair. However, enjoying a long day out and not being so exhausted, or a rough day of pain when your chair can keep adjusting you without having to go to bed, or wanting to go out on rougher terrain that is very difficult in a manual chair, make a power chair a valuable piece of equipment. There are SO many cool mobility products on the market and I love it when friends send me messages telling me about them. The reality, however, is they are very expensive and insurance won’t touch them. Insurance hardly ever pays for both a manual and a power chair! When you are trying to decide to get a power or manual chair, there is much wisdom in a manual chair with a power assist…if you can get insurance to pay for the power assist. They don’t like paying for them. Vocational Rehab is paying for mine and insurance is paying for my chair. Because of my level of injury, I now need a power assist or I will have to use a power chair all the time, so Vocational Rehab paid for my power assist to help me be able to continue working. That may be an option you want to look into! New Smart Drive power assist – this has to be on my on my chair all the time now because my arms have gotten much weaker this past year. Hopefully, new seating and a new manual chair will help heal some of the overuse and damage. This power assist will be SO helpful for that wear and tear on my upper body. Quickie QM 710 – I just can’t tell you what a help this power chair has been to me. This is a silly pic, but this was a LONG day at the park with my kids. By this time, we had been there for hours and my nerve pain was awful. While they played on the playland, I laid back to get all the weight off of my backside and legs. After about 15 minutes of laying back, my nerve pain was back to manageable again. I could have cried it was so wonderful! The other way would have been to be miserable while trying to let the kids play and then having to call them to go home so I could go to bed. This has brought me SO much more up time and freedom from my bed. It may seem little to some, but this has been HUGE for me! Let me know your thoughts about your mobility equipment! Chronic. Intimidating word isn’t it? Whenever I hear that word it gives me a mental picture of someone curled up in a hospital bed dying! However, that isn’t always the case. Chronic means “persistently for a long time or constantly recurring.” For those with long-lasting health conditions that just do not go away, life can get very discouraging. When I woke up paralyzed in 2009, unable to feel or move anything from my upper ribs down, my arms extremely heavy and fingers slow to respond, I had entered the world of a chronic health condition. Caused by a virus, the swelling around my spinal cord had permanently damaged it. This wasn’t going away. Nine years later, I am still here and living life from a wheelchair. There are hundreds of small things that constantly pop up as secondary conditions to paralysis and each time they do, it is an opportunity for discouragement. However, I am happy. Life is precious to me. I am still on the journey and learning each day, but may I share some things I have learned to combat discouragement and offer some practical help? I know we say it, but really DO it! I have spent many a night in fear of the future, in horrific pain, crying and having a panic attack…and I just ask Jesus to please come and hold me. I tell Him I am a scared little girl and I need my Daddy to hold me. I just pray. Do you know that most of the time I fall asleep praying? I KNOW He has rocked me to sleep comforting His girl. Keep your eyes on the bigger picture! When you are in the moment of discouragement, it hogs the lens of life. Everything looks dark and gloomy. But step back. Take in the whole picture. God has been faithful; He will be again! Don’t get sucked into the emotion of now. Keep an eye on the reality of our tomorrows. Look for the fingerprints of God all around you! When I see the sky, I remember how big God is, and He is in control. When I hear birds sing, I remember that He cares for the sparrows and He cares for me. When my heart is moved watching others show compassion, I remember that God is full of compassion for me! Intentionally look for ways to let life and others encourage you! Don’t look for the huge things. Look at the million little things that go on every single day. It could be a smile, a song, a hug, a call or text, a cuddly animal…anything good! Notice them. Appreciate them. Together they become huge! Dwell on what you can do! There are many losses that can come with long-term issues. Grieving those losses is a natural process, however, don’t wallow in them. Instead, make a list of what you can do, or even what you can learn to do. Find your new niche and do it well. Find a sense of accomplishment that makes you still feel like a productive citizen. We all need purpose in our lives to thrive. Discover it and dwell on that! This was hard for me and took me several years to get to this place. Unless others live in your body and know what you deal with daily, their opinion of what you should or should not do cannot have much weight. My husband knows me more than anyone, and he is also the first one who will tell me his feelings. Sometimes that has been to say no to others, or to go to bed. He has also been a voice that has told me to stop pouting and to go do something. Learn who these people are in your life and give your ear to those who truly know your situation. If they do not, then ignore them. Having just said that people don’t understand, I must also say that we DO understand. I know when I want to skip out on something and blame my disability vs. knowing that I really cannot do it without serious consequences to my health. Some of this has been learned easy, and some of this has been learned because I have failed to prioritize. A rule I live by: If I can do anything else today, then I can do this. Meaning….am I too tired to go to church on Sunday? Will I also be too tired to go out to lunch? If I am too tired for Sunday, what did I do Saturday that wore me out? Did I have to do that Saturday? Can I change my schedule to make Saturday’s lighter, so I can attend church on Sunday? I have had to learn to look at my life a week at a time. I must look at what needs done that week, what is most important that week, and structure my week accordingly. It is imperative that I schedule rest days, or I end up in bed 2 weeks at a time. Sometimes, a certain activity will absolutely cause me a tremendous amount of pain later and the entire next day. I avoid those things like the plague if I know I need to do something the next day and need to be able to move around! Other things, with my disability, are invisible secondary things that I cannot control. If my stomach is messed up, I will need to stay home where my accessible restroom is…and quite frankly, clean clothes. To deal with all of that while out and about is extremely difficult and embarrassing. Although I may look great and feel great (except for my stomach being messed up), I cannot leave my home. There is not a one-solution-for-all when dealing with prioritizing for your chronic health condition as we are all unique. But, I would dare to say the unifying statement for all of us is that it is VERY easy (because things are so much more difficult for us) to use our chronic health condition as an excuse when we really wouldn’t have to if we prioritized and were wiser with our planning. I was told early on, to push yourself to do one thing each day that you just do NOT feel like you can do. Some days, this is honestly just getting up, getting a shower and getting dressed! It takes all my strength and I am done. Thankfully, this is not every day! Other days, it is taking on a project with the kids, a day of work, or a day out with a friend. Regardless of what that one thing is, do it. Immediately start the process of getting all your clothes on (thankfully, most of the time with help from my sweet hubby who cannot stand to watch me struggle doing this) and I gladly let him because I am beat! Transfer back into the wheelchair to go blow-dry my hair and put on my makeup. Unlock my door and let my kiddos rush in to show me how handsome and pretty they are and just hang out. This always makes my morning brighter! Time to go to church and roll out to my van where I transfer again from my wheelchair to my driver’s seat, drive to church, transfer from my driver’s seat to my wheelchair, and wheel in the church ready for breakfast and a smile! Want the truth? If I did what I “felt” like doing, or what is easy, I would have never left my bed! This is not to say my life is so bad. This is totally my normal and I don’t think of it like “this is so awful”, but it is my reality. I just know what is important that day, and one step at a time you do the next thing you don’t always feel like doing. But would you like to know another truth? Even though Sunday is the hardest day of my week, it is also one of the happiest! A lesson for me is that many times what has been physically difficult has been extremely rewarding emotionally. You must find the balance. There have been times I have had to say “no” to afternoon company because I need to go to my bed all afternoon and rest so that I can go to the evening service. There are times, like this past Sunday, that I wondered if I would even be able to go Sunday evening. I woke up with a red pressure area on my tailbone that can quickly turn into a pressure sore. I went to church that morning with both Jimmy and I worrying it might get worse at church. I came home and stayed in bed all afternoon and by evening, it was looking better. Had it not looked better, I would have stayed home in bed and not went to church. Not because I felt bad, but to keep me from getting a pressure sore that could keep me in bed for months at a time! The point of all this is to say that you know what your hard is. You know what you need to do to challenge yourself a bit more. We are always easy on ourselves. It is called self-preservation! However, when a long-lasting condition is part of your life, you can’t always live on easy. You seek the necessary and find the strength to push yourself from easy to necessary. It is a challenge we need to have for ourselves. I have belabored this point, but I feel it is SO important for those of us who have health challenges that do not go away. This is our life, so we must fight ourselves with this very point, or it is just too easy to become lazy which leads to discouragement which leads to depression and it is a vicious cycle that is hard to get out of. Chronic health conditions do not have to mean that life is over. It doesn’t have to mean you are dying. It means that life is not as it once was, and you must think through many things to deal with your own issues. For most things, the quality of our lives is dependent on the quality of our choices. Therefore, we must choose wisely to help us emotionally and physically. If you have thoughts to add, please comment below and let me read them! I always love learning what has helped others. Here we are again – March 12th. This day, 9 years ago, I woke up from a 24 hour nap…completely paralyzed. No feeling or movement from my upper ribs down, my arms SO heavy and stiff and slow to respond. One day you are fine, and one day you are not. Just that quick. Today is my anniversary. The day our world turned upside down. The day I choose to remember and to reflect on where this journey has taken me. Will you join me? Year 1 – I barely remember! Becoming paralyzed while 5 months pregnant, a million doctor visits, hospitalizations, the birth of my healthy baby boy, multiple complications, and finally the start of therapy. It is all a gigantic blur with lots of tears – sad and happy. Year 2 – Therapy!!! Occupational therapy, physical therapy, repeat over and over and over. This year was driving 500 miles a week with 6 children, 10 and under, and a precious hubby who would sit for hours in a waiting room with all of those kids while I had therapy. I couldn’t drive so he drove me. We didn’t live near family and you don’t want to ask people to babysit your 6 children (including a baby) 3 times a week for multiple hours a day. We drove 1 1/2 hours to therapy, were there for 2-3 hours, and then 1 1/2 hours home. I would be so worn out, I would sleep all the way home and the rest of the day once home. I was absolutely exhausted. I worked so hard in therapy trying to get every ounce of return I could. It did help and I learned so many new things and much independence to take care of myself. But…not much physical return. Which led to year 3. Year 3 – one of my toughest years. Therapy wasn’t seeing anymore progress in me so I was done. And I was ready to be done. I wanted my “normal” life back with my family. But that normal was a new normal and now it felt really permanent since the paralysis hadn’t gone away after all that therapy. Emotionally, this was my toughest year although I was feeling much better physically. I was learning how my new body worked and how to read the signs it gave me. I learned how to deal with many of my physical challenges and some of the fear and anxiety had really calmed down. I also finally got a very good neuroimmunologist that year that completely understood my spinal cord injury that had been caused by Transverse Myelitis and he taught Jimmy and I so much. I think Year 3 was a year of emotional transition for me from the old “able-bodied” world to becoming a full-fledged member of the disabled community. It was a rough year of getting through that process, but I finally found peace in that future. Years 4-7 – Life continued. We moved from OH to TN to SC as Jimmy’s pastorate changed. We made new friends, kids kept growing up, we had victories and failures in our marriage, our parenting, and our Christian lives. Emotionally, things were very good. I became much more involved in the disability community and made many dear friends. Opportunities to speak and share my testimony started pouring in and kept me very busy! Physically, I had a few things come up that is common with spinal cord injuries but nothing major. Life is beautiful and we love living it!! Year 8 – Some physical changes. I have always dealt with spasms, nerve pain and fatigue, but this past year has been the worst. And…it has really affected my upper body strength. My spinal cord was damaged at the C5-C7 level which is in your neck. It was caused by swelling and so I am considered an incomplete injury – which means some nerve signals DO get through. They can go through really slow, or really confused, or really painful, or they might even actually work!! If I had a complete injury and NO signals went through, I would have very little use of my arms at all. So, I am very thankful for all I can do with my upper body! But, I can tell a big change in me this year. It has been very troubling for me as we have been trying to figure it all out! Is pain causing the fatigue and weakness? Is fatigue causing pain? Is something going on in my body I don’t know about (because I can’t feel normal) and that is causing spasms? Are the spasms causing the pain or is the pain causing the spasms? Am I fatigued because something is wrong or because I am not sleeping good because of spasms and pain? See how confusing it is?!!! It is also really frustrating! This past year has had me in bed way too much just because I cannot physically sit up in my wheelchair for too long. I can’t even sit in my living room chair because the nerve pain and spasms just get so bad. The only thing that eases it up is laying down. Thankfully, it is not every day!! But it has put a major damper on longer activities because I just cannot tolerate it. My arms (especially my left wrist and fingers) are much weaker. So…my activity level has been down because I just haven’t been able to lift weights or do too much active because it causes such pain and just flat out wears me out and I am shot to do anything else. So, that has been a bummer. When I try to push myself and power through it, I end up paying dearly for days. So, Year 8 has been a year of many doctors visits and tests trying to make sure things are okay and trying to figure out what is going on and what we can do about it. I am happy to report that that this year ending has been much more encouraging than it began with a wheelchair seating evaluation about 3 months ago. We finally feel that we have some answers. Also, I have a dear friend who is a physiatrist (a spinal cord rehab doctor) and he has been working with me to figure some things out. Dr. Chris is retired now, but is a wealth of knowledge and has helped me sort through some problem solving and solutions to try and work through with my family doctor. My family doctor has also been so supportive to explore all avenues. So, this year, Jimmy and I decided that I needed to take this year off and just rest. He has been saying it, several dear friends had been telling me to slow it down, and then my own body. No speaking engagements (other than 1 in the fall when we have family vacation and 1 local) this year. I think I have said “no” more this year than I have in my entire life! It has been hard, but SO wonderful! Our church has been amazing to just jump in and take such a load off of me. It is VERY hard for me to not be in the middle of everything, but it has been SO nice to not have to. The other change is that I have also started using a power chair more if I am outside on rougher terrain or for a long day or evening. Dr. Chris and the therapist both strongly recommended it. I was gifted with a very nice power chair that reclines and has a tilt feature. This may sound silly, but when you are in SO much pain you cannot endure sitting one more second (I feel like I am sitting on a huge pile of sizzling hot shards of glass from my lower back all the way to the heels of my feet) and your only option is to get in your bed, the power chair has been wonderful!!! I just tilt back and get all the weight off of my backside for a little while and it is just like laying in bed! The pain starts easing up to where it is bearable again and I am good to go! NO BED!! It has really been quite amazing for me. And…I can tell it has made a HUGE difference which further proves what the seating specialist says. I do believe that when I get my new manual wheelchair with better supports to hold my body in place that it won’t take such a tremendous amount of work to get me from point A to B which in turn should help my pain, which I now think causes my spasms to get worse,which makes sleeping very hard, which exhausts me. It has been a vicious cycle this past year but I truly feel there is a light at the end of the tunnel!! So, to Year 9, I want to say…. The first year of this ride, I didn’t think I would even live to see this year, so I am thrilled I did! I am okay with this being 9 years. It’s such a wonderful journey – even through the rough times. Life is a precious gift! You and I are going to make it just fine, Year 9, if the Lord wills. Thank you, dear readers, for following my journey with me. Thank you for your friendship and support. Thank you, most of all, for your prayers for me and my family! When I was first paralyzed, we lived in Ohio. The winters there were long and cold. We didn’t get huge amounts of snow at a time, but many little ones that just seemed to keep the air wet and the ground a frozen sludgy mess. I used to not mind winter at all. I enjoyed the slower pace, and bundling up with the kids to go play. The cold just isn’t the same anymore. At all. It is absolutely unbearable and it isn’t just me. It is very common within the spinal cord injury community. So, what’s the big deal? If you scroll to the bottom of this post you can see a few sources I have linked to and you can read a lot of good info. But I want to keep it simple here. Simply…it is not that we don’t like the cold. It is that our bodies literally cannot help us with getting too cold or too hot anymore. When I get cold, my nerve pain goes through the roof. My spasms and spasticity get really bad and my body gets hypersensitive. Meaning, if you touch or move my legs wrong, you will probably get kicked and I have zero control over that. My spasticity makes my body feel like I am wrapped in very tight rubber bands from my shoulders down and makes moving extremely hard and very painful. I lose all fine motor skills. I. Am. Miserable! Sunday morning, it was very cold here. I only left the house to go to church! Just from the that, it took me until 4:00 p.m. that afternoon to get warm! Just in time to go back out for our evening church service at 7:00! 🙂 I don’t like getting cold. Here are some tips that we do in our family to try to help me from getting too cold. I am also providing links so you can see what I am talking about! Layered Clothing. Because you can overheat (even in the winter with all the trying to stay warm), it is best to dress in layers. Multiple thinner layers are much better indoors where you can add to or take away as needed to help keep your body temperature in the comfortable zone. Thermostat Settings. In my dream world, my house would always be about 75 degrees. But, I live with my family and I am very outvoted! However, we do have to keep our thermostat on 70 degrees. That is the absolute coolest I can stand in my own home without feeling very bad. And even at that, I ALWAYS am sitting underneath a blanket – summer and winter. It may cost a little more in electricity, but keeping home temps bearable are very important. Hot Tea. A hot drink warms up the insides and really helps to take the edge off the intense cold. I also like coffee, but try to keep my acid levels down. So, I mostly drink hot tea. Any herbal tea is delicious. My favorite daytime usually has a mint in it and at night I enjoy drinking a Sleepy Time Tea with valerian and chamomile to help relax my body and spasms. Hot Showers. If I am absolutely miserable, I will go take a hot shower. It is a lot of work to shower so I have to be really, really cold to go to all that trouble. My Hubby. Even if I am warm all evening, when I lay down at night, I will freeze for about 20 minutes. My theory is that the cold blood that pools in my feet and legs all day from bad circulation suddenly circulates when I lay down. It truly does feel like ice water running through my veins as it is a very deep freezing chill. My sweet hubby will put my legs and feet against his warm body heat and rub them until they get some warm blood flowing back into them! After about 20 minutes, I eventually warm up. Stay In. This isn’t realistic for most of us, but trying to avoid extreme temps for long periods of time is the best prevention. When you have to be out, try to make the outdoor time as short as possible. Warm Your Vehicle. If possible, have your car started and the heat going before you get in. The metal of a car holds in the cold and it quickly seeps in! Get the car warm before you have to get in! Furry Boots. I have a very warm pair of fur-lined winter boots that zip up the side so that I can get my feet in them easily. If I know I am going to have to be out in the weather, I always wear these boots to help keep my legs and feet warmer. Regular shoes don’t seem to keep my feet as warm. A Blanket. If I will be outdoors, or in any place I think I will be cold (like a movie theater or something), I take a lap blanket with me. If I forget, I always regret it! I also have one in my vehicle when we travel, as my family and I don’t agree on car temps either! A Hoodie. I don’t do well in coats as I feel very restricted to push myself in my chair. I always wear multiple layers, and wear a large hoodie with a front pocket to keep my hands in. If the wind is blowing at all, I love having the hood to put up around my face. These are my tips and helps for staying warm this winter – inside and out! If you have any of your own tips, I would love to learn them so please share in the comments! So…What Can You Feel Or Move? Several years ago, I had a new friend and she had an adorable little girl who was trying to wrap her mind around my paralysis. She touched my leg and said, “So you can’t feel that?” I said, “No.” Then she rared back and kicked my leg – very hard!! And then she said, “Well, could you feel that?! !” Horrified, her mother scolded her for kicking me and informed her that I most certainly could bleed and get hurt. I just started laughing because in the mind of that little child – if I couldn’t feel something lightly touching my leg, than surely I could feel a big kick! She was disappointed as I told her I could not feel that kick either! Apart from little children, I do get asked quite often exactly what I feel and do not feel, and what I can or cannot move. Since the general consensus seems to be “oh…you are paralyzed and therefore you don’t feel or move anything” is incorrect, I thought it would be fun to educate a little! One thing we must get straight, and has been mentioned in other posts on this site, is that spinal cord injuries are like snowflakes – there are no two that are just alike. What I am going to tell you describes me, but that doesn’t mean another person with a spinal cord injury will present with sensation and movement like mine. I want to clear up something. It is incorrect to say that we have no feeling or movement. We are much more neurologically complicated than that. There are sensory nerves (that control sensations such as touch, pressure, pain and temperature) and there are motor nerves (that send the signals to move to different areas of your body depending on where they are located on the spinal cord). When the spinal cord is injured it affects both the sensory nerves and the motor nerves. But how much is affected? Why can someone move a toe but nothing else? Why can they feel vibrations but not a pin prick? Why can they feel deep pressure but not light touch? Since the sensory nerves control so much varied sensations, a person with a spinal cord injury can have a variety of “feelings”. Also, when a spinal cord has been damaged, the nerves get very confused and they do not carry the appropriate signals back to the brain. So, at times, if someone taps my leg and says, “Can you feel that?” I cannot feel the tapping of their finger on my leg, but 9 times out of 10, I will feel a sudden electric shock down my opposite leg. My confused nerves have the wrong leg (called reciprocal pain), and it has interpreted a light touch as a bolt of lightning. Others may feel different as all of our nerves interpret with their own language. The question “what can you move” is valid, but a word should be added. The question should be, “What can you move voluntarily?” If you could see my legs move at times, I would never be able to convince you that I am paralyzed. When my legs decide to move involuntarily, and on days of my worst spasms, my legs jump and thrash and kick wildly. My body stiffens up so tight and my legs will cross and my strong hubby cannot get them to bend no matter how hard he tries. Y’all…I have some powerful leg muscles!! But they are not in my control at all. They do their own thing and I watch them, totally disconnected, except for the pain they are causing me in that moment. It is very surreal to me – to see all the power that is had in the times of spasm and still not be able to connect it to my brain for voluntary movement. So, what can I voluntarily move? My injury is high (C5-C7), but I am an incomplete injury which has left me with an unusual body (most incomplete injuries have weird nerve interpretations). If I was a complete, I would have very little use of my entire arms. However, I am not a complete. The difference in my sensory and motor nerves are varied all over my body. If you look at this chart, you can see what areas a C5 level injury would affect. It would affect that level and everything below it. However, if you look at this image, you can see how simplified the above photo is. This photo is all the sensory and motor nerves that are within that same level. I think you can see now why spinal cord injuries (as most are incomplete) present as unique as snowflakes. What signals get through to which nerves? Which nerves are they – motor or sensory? Does the signal go through as supposed to or does it get a scrambled message and do what it wants? Does it then create normal sensation and voluntary movement? Or abnormal sensation and involuntary movement? For me, I have better motor nerves in my arms and hands than I do sensory nerves. On my right arm, I cannot feel pin prick or light touch and I have decreased sensation for hot or cold. On my left arm, I can feel light touch but not pin prick. On my chest, I do not feel pin prick or light touch but can feel deep pressure. I lose all sensation from my chest down with the exception that I remember feeling some vibration in my legs when I was in therapy and they used high levels of electrical stimulation on my legs. I can also feel a little deep pressure on the tops of my feet when Elisha jumps on them. It doesn’t hurt at all, but I can usually tell he is on them. Other than that, my sensory nerves are pretty shot. My motor nerves are better though in my upper body. I have good movement in my arms and hands, although they tire and get very heavy and burn horribly if used too long. There is not a time that has went by when I play the guitar or piano that my arms do not feel like someone has been sanding them with sandpaper. The longer I play, the worse I will play as my fingers will no longer go where I tell them. I cheat on many chords because my left pinky will not do much against resistant. There are weird moves I just know not to do or have learned to compensate. If I bend my wrist, it makes the grip in my fingers tighter and they work better. If my hand is facing down and I am trying to pick up or grab something, it is very difficult for me to do without bending my wrist to compensate. I have learned to grab and flip my hand over quickly to keep from dropping things. However, dropping things is a norm for me too. 🙂 These are really very minor in light of how it could be, however, I do feel these deficits daily. The muscles in my back and stomach are very weak and I can have days where they feel like they are firing better, which makes all my transfers, rolling over in bed, getting dressed, toileting…much easier! And then there are days where they are just not having it. I need more help on these days and these are the days Jimmy helps dress me and gets me in and out of my chair. Typically, at the end of big days, Jimmy always has to help me undress and get me into bed. I welcome that help!! From my upper ribs down, I pretty much have no voluntary motor nerves…with the exception of a big toe that I can get to move a couple of times on a good day . Don’t know where that nerve comes from! This diagram shows where my sensory nerves (in blue) and motor nerves (in pink) are gone. However, if all my friends with the same exact level marked their motor and sensory, it would look different from this. Apart from what is normal sensation or movement, there are many of us who suffer with chronic muscular and neurological pain. The muscular is from overuse of the muscles that DO work and we overcompensate with them for so many that don’t work. The neurological pain has to do with those confused nerves that fire and shoot and stay confused. Many of those signals get sent as pain. This can change based on our time spent in one position too long (either in our wheelchairs all day, or in our beds all night), the weather, stress, illness, fatigue, spasms and spasticity. A positive is that neurological pain can let us know that something is wrong in our bodies that we cannot feel normally. For example, if something is “off” my legs start spasming and won’t calm down and electricity starts shooting up and down my legs. I know to investigate for something wrong – a tight shoe, a wrinkle in my clothes, a full bladder…or other things. I always feel like I am sitting on sharp gravel, but the longer I sit in one place, that sensation turns into shards of glass and I become extremely uncomfortable and quite miserable. Although I HATE that pain, I am thankful that it reminds me to do pressure reliefs and to reposition myself so that I won’t get pressure sores. My spasms and spasticity has increased the last two years, and I am trying to learn ways to trigger them so that they can help me with other functions. For example, if Jimmy lifts me straight up out of my chair quickly, my legs will stiffen and can hold my body weight for a few seconds. That takes some of the load off of him while he can reposition. However, it is completely unpredictable how long that lasts and when they give in, I collapse so it isn’t dependable. I would love to learn how to make that a little more dependable. I am hoping PT could help me with that. There are times though, that you cannot find an explanation for your pain and you just have to deal with it. Can feel things in their bodies. It just isn’t what you normally feel. May have movement in their bodies. It doesn’t mean it is voluntary! Some parts of the body can have sensation or movement that is somewhat normal and voluntary, but still not be able to feel or move other things as incomplete injuries have confusing nerve impulses. Neurological pain can still be felt in areas where there is no sensory nerve signals. If you have any more questions or comments, please share with me! The last 2 years have been pretty rough. I have experienced a LOT of pain…that eases up but never goes away. I hate the 1-10 pain scale, but a good pain day for me is never a 1 or 2. I had a friend ask me once where my pain was and I told her that she would have to give me a minute. I had to stop and analyze and scan my body to even be able to tell her. Or what kind of pain? Muscle pain? Bone pain? Nerve pain? Joint pain? Yes! I had pain from my neck to my toes. I have also fought terrible fatigue, which has been since day one but much worse when my pain levels are high. I have tried so very hard to stay off pain meds. I really, really like how they make me feel and I know how very easy it would be to become dependent on them and as long as I can manage my pain without going crazy, I want to stay off of meds! Having said that, “managing” my pain the last year especially has meant having to get out of my chair and lay down. I absolutely have to get off my backside and stretch out my legs to get any relief. However…that sure stops life!! I have struggled not being discouraged and just concentrating on one day at a time dealing with all of this. I try to do what I can and when my body says no, I just have to stop. I try to stay busy to keep my mind on other things, and the days out of my chair, I try to do computer work. But…the thought of many more years of this is very daunting at times. But, may I share a HUGE revelation to us that just happened last week? I have been paralyzed almost 9 years. I was in horrible pain, went to sleep, woke up 24 hours later and was paralyzed. Diagnosis? Idiopathic Transverse Myelitis. My spinal cord was damaged by swelling at the C5-C7 level. I saw about 4 different neurologists in Cincinnati, OH. I went to Cleveland Clinic for a week. I saw a neuro-immunologist at Ohio State University who specialized in TM as my follow up care until we moved away from Ohio. I have seen several physical therapists and since moving to South Carolina, I have had 3 different seating evaluations. In ALL of this time, I have never had muscle testing of my upper body. I had sensation testing (pin prick for pain perception, cotton swab for light touch, hot and cold, deep pressure and vibration) on my upper body and we always knew there were sensation deficits, but no one had ever done isolated muscle testing on all my upper body muscles to see what was firing or not. I have been trying to get a new wheelchair for the last 3 years since living here in SC, but have had fits with my insurance and finding a wheelchair vendor who would accept my insurance. I managed to change insurance, and found a national vendor that would accept it. Then, I had to make an appointment to a seating clinic in Charleston that has a seating specialist and a large supply of cushions and back rests that you can actually try! It took me 6 months to get into this clinic. I went on December 6, and had a seating evaluation with the physical therapist who specializes in spinal cord injuries and does the seating evaluations. As we sat talking and her asking me questions for about the first 20 minutes, she said, “I can already tell that you have quite a deficit in your upper body muscles and know that your chair is absolutely wrong for you.” Mind you, this is my first custom chair that I have used for 8 years now! I said, “What? !” She said, “As we have been talking, I have been watching you and you are struggling just to keep your balance sitting.” I said, “Oh I know. I always have.” She was horrified and said that we were going to do upper body muscle testing. As she kept isolating different muscles in my upper body, my mouth just kept hanging open. She would tell me to move this, push against this, pull this way and that, don’t let her pull or push…and on and on! I was shocked at what I could NOT do. I kept telling her to do it again and to let me try again! I just kept looking at my husband in shock. She went on to tell me that pain and fatigue will always be a part of having a spinal cord injury but that she felt confident that setting my chair up with the proper support for my body will help eliminate a lot of it. She said that my overcompensation has really done a number on my body and it just cannot do it anymore. I felt like crying for joy! Then I felt angry. Angry that it has been almost 9 years and NO ONE ever muscle tested my upper body to know what deficits I really had. Angry at how easy it is to fall through the cracks and not get proper treatment. Angry that I have been sitting in a chair that has not been the best for my body long term and has caused damage. It has hurt working muscles and made them weaker. It has caused my pelvis to twist. I have slight scoliosis, and it has contributed to chronic pain for the last two years. My sweet hubby sat there watching me try so hard to move things and said he just kept choking back the tears. It was really a very emotional day for us. But, at the end of it all, we were both thankful. Thankful that we finally saw hope for some relief for my pain and fatigue. Thankful that we had found the right people to help me, and thankful for the education that I most certainly want to pass on! I know that not all chronic pain and fatigue may be caused by a bad fitting wheelchair, but after sharing my story with my other wheelie friends this week, this is a VERY common scenario and one that I hope we can work hard to eliminate. If we can help anyone else not go through what we have, than it will make it worth it. Tilite TRA – titanium and carbon for lightweight pushing weight. We are bringing in the front of the legs of the chair, so that it will help hold my legs in and keep them from splaying out which should help with hip pain. Java Forward cushion – that will hold my hips in place and stabilize my pelvis. Since it isn’t an air cushion, it will also keep me from constantly feeling like I am falling to one side or the other and trying to keep my balance. Roho Agility back rest – with medium contour that will wrap around me to stabilize my core and abs so that I won’t have to spend so much energy trying to sit up straight. It should also help the scoliosis to not get worse as it will help hold my spine straight. RibGrips pushing rims – I tried a couple other kinds of rims which are supposed to help with my carpel tunnel pain, but they were too slick and I just could not grip them tight enough to get a good push. So, we are sticking with my RibGrips which I have absolutely loved as I don’t have to grip them and still get a great push. 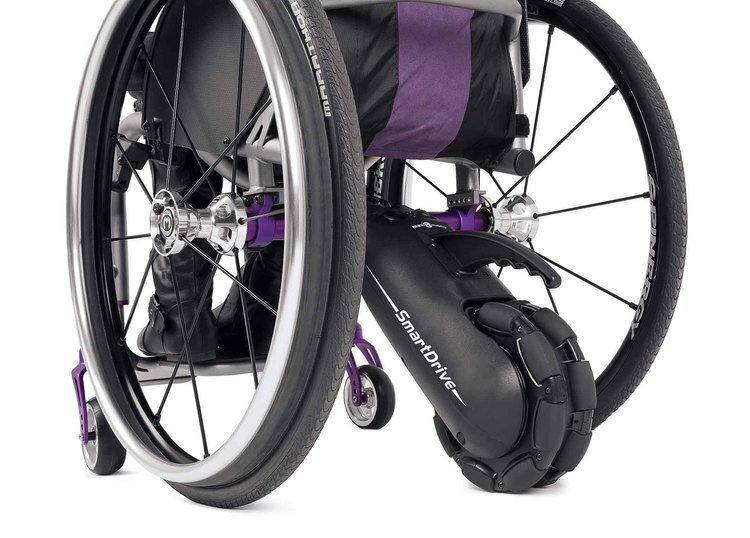 Smart Drive Power Assist – she wants me to consider a power chair as a second option for outdoor and harder pushing, but she is going to see how I do with using a power assist all the time on a manual chair. She is concerned for my shoulders and arms and ruining them if I continue the current overuse and strain, but she is willing to try a power assist on a manual chair and watch me for the next year. I hope it works! This is what she thinks will help my quality of life, but that doesn’t mean this would work for anyone else. Our injuries are unique, our needs are specific, and our equipment should be just as custom. So, please make sure you are getting exactly what you need! I would love to hear your story about this, so please comment and share with me if you have one!